Who was Joseph Pilates and what is the exercise method that bears his name? What's so special about Pilates? How can I be sure that my instructor is teaching "Classic-Style"
Where can I find Classic-Style instructors in my area? Who was Joseph Pilates and what is the excercise method that bears his name? 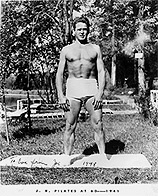 Joseph H. Pilates was born in Germany in 1880. Former acrobat, pugilist and World War I POW, he developed into what can only be described as a fitness visionary. After decades of research, he brought to New York City in 1926 a method of body conditioning the likes of which health and exercise enthusiasts had never seen. Rather than focusing on sets of repetitive weight-bearing movements, Pilates developed a series of specialized exercises to build strength, control and flexibility. Many of the exercises could be performed on nothing more than a floor mat, although hundreds were developed using a series of specialized machines. Joseph Pilates taught his method of "Contrology" until 1967, when he died at the age of 87. Now, more than seventy years after its introduction, the Pilates Method of Body Conditioning has become one of the most popular forms of fitness training available. Not only has the professional dance community embraced it as the premier method of core-strength training, but athletes and celebrities have used it over the decades to develop the svelte, powerful bodies that their professions demand. Despite this somewhat glamorous background, Pilates training continues to be one of the fastest growing exercise methods for all walks of life -- from pre-teens to octonegarians, Pilates is embraced not only as a form of specialized training and physical rehabilitation, but as a deeply effective method of achieve health and well-being. Simply put, Pilates feels good. As Joseph Pilates himself said "You will feel better in 10 sessions, look better in 20 sessions, and have a completely new body in 30 sessions." Clients move gradually through "Beginning", "Intermediate" and "Advanced" stages of development, focusing at first on the core "Powerhouse" area of the body -- generally the area of the body that consists of the abdominal muscles, lower back, hips and buttocks, working together to form the core strength of the body. Development of this area is critical to the advancement of the client through the stages of progress. Clients are not advanced until their bodies are ready. Movements are generally not performed rapidly nor are they repeated in many sets -- rather, the focus is on control, deep strengthening, lengthening and flexibility. Both the mat and equipment exercises are specifically ordered and tailored to lengthen and strengthen, rather than build bulk. Symmetry and flexibility is stressed, as well as absolute control. Pilates bodies are leaner, more balanced and stronger than average. Sessions are one-on-one, and usually last about an hour. Clients are closely observed and are coached by instructors through each movement until the client masters the form and intent of the exercise. Unlike many exercise methods, teachers of Classic-Style Pilates are highly trained. Individuals cannot apply to become instructors without a prerequisite 75 private sessions with one or more certified instructors. Once the application is accepted, the client enters the certification program. Each would-be instructor then attends a series of intense training workshops and must apprentice themselves to an Affiliated Studio for no less than 600 hours. During these 600 hours of apprenticeship clients are observed and guided by "Teachers of Teachers." A series of 3 written and 3 practical exams insures that the apprentice is ready to teach without observation. It can take a year or more for a client to achieve full certification. What are Pilates exercises like? There are two major elements to the Pilates method -- "matwork" exercises and those movements performed on equipment. Over the course of a lifetime, Joseph Pilates developed hundreds of exercises using both a simple mat on the floor as well as a variety of specialized equipment, referred to as "apparatus." These include the Reformer, the Cadillac or Table, the Chair, the Barrel and several other specialized pieces of equipment. Pilates exercises were primarily developed to align, lengthen and strengthen. Movements are generally not "aerobic" in nature, particularly in the beginning. Instead, Pilates exercises vary in dynamic depending on the exercise. Control and precision are emphasized, repetitions are fewer and focus on isolating muscle groups and developing core strength. Joseph Pilates developed hundreds of exercises, most of which can be modified to suit various body types and injuries. How is the Pilates Method Taught? In general, Pilates is taught one-on-one in 1-hour sessions with a professionally certified Pilates instructor. This is especially true in the beginning, and for any exercises involving apparatus. A typical Pilates private session consists of both apparatus and mat work as well as any specialized exercises to address your individual body type. In this way the client gradually builds strength, control and balance before moving to more advanced exercises. What is "Classic-Style Pilates" ? In October of 2000 there was a legal decision in Manhattan Federal District court that effectively cancelled the Pilates trademark. This decision, while having the effect of allowing certain longstanding Pilates centers and equipment manufacturers to use the Pilates name without paying dues to any organization, also opened up the possibility of anyone becoming a "certified" Pilates instructor. There are now websites where prospective teachers can purchase a "Pilates Certification" for $39.95! As a result, potential Pilates clients must become aware of the distinction between highly trained instructors in the method approved by Joseph Pilates and those that have obtained their "certifications" by less rigorous means. All three of these schools offer their own certification, and in the opinion of Orange County Pilates, all three are valid methods. On our site, we feature only links to studios that are affiliated to one of the three branches listed above. What is "Power Pilates" ? Power Pilates has been operating since 1989. In 1997 they established the certification programs in New York City to preserve and teach the classical technique of Joseph Pilates. The demand for quality instructors lead to an international network of training centers all of which meet Power Pilates high standards of education and commitment to excellence. They have certified over 2000 instructors at over 20 different locations worldwide. Where can I find a Power Pilates Instructor in Orange County, California? Currently, there is just one studio in Orange County that is a participating Power Pilates center. The name of the studio is "House of Pilates" and they are located in Irvine, CA. How can I be sure that my instructor is teaching "Classic-Style Pilates"
"Classic-Style Pilates" is a general term to describe a Pilates school or branch which adheres as much as possible to the original teachings of Joseph Pilates. If you are considering Pilates instruction, and would like to be sure that you will be receiving the best training possible, ask the Pilates center or individual instructor how they were certified, by whom, and how many hours of instruction/apprenticeship they received. If they are certified by one of the schools listed above, then you can be sure they have received an adequate amount of training. Naturally, this is important, especially from a safety standpoint, but it does not account for the wide range of expertise which is gained through experience, and natural talent. Where can I find Classic-Style Pilates instructors members in my area? If you live in Orange County, California you should visit the Orange County Pilates website. Most instructors based in Orange County certified by the Pilates Studio of New York , Romana's Pilates, and Power Pilates are listed on that site. If you live farther away, the best way to find an instructor near you is to check the instructor listings at the sites shown above. I am interested in becoming a Certified Pilates Instructor. Is there a certification center in Orange County? There is one now! We are happy to report that there is now a certifying center where prospective students can become certified in the Power Pilates program. Pilates Certification is rigorous, but well worth it, both in terms of job-satisfaction and financial rewards. House of Pilates located in Irvine, CA, is a Power Pilates Affiliate Training Center. Affiliate Training Centers have a "Teacher of Teachers" onsite, and students can do all of their training at the center itself. This is enormously convenient for residents of Orange County, CA who wish to become Certified Pilates Instructors.